The basking shark is the second largest shark in the world, after the Whale Shark. It belongs to the order Lamniformes, the family Cetorhinidae and the genus Cetorhinus. Average adults range between 20 and 26 feet in length and weigh between 6,600 and 13,000 pounds. They can be found in the arctic and temperate waters around the globe. Their scientific name is Cetorhinus maximus. They are peaceful animals as they do not hunt other marine animals or harm humans. Basking Shark has a conical body which is covered with a layer of mucus. It has gray or brown skin on the back and white on the belly. Their diet mainly comprises of plankton. This is a reason why they are not a common predator. This shark is also called the Sunfish, the Bone shark, the Elephant shark, the Sailfish shark, and the Big mouth shark. These sharks have very large livers that make up to 25% of their total body weight. Their mating season starts in early summer. Females have a gestation period of around one year. These sharks give birth only once every two to four years. They have the smallest weight to brain ratio of any shark. It is because of their passive temperament. Earlier, the liver of basking shark were a valuable resource. The oil extracted from them served as a lamp fuel. The average lifespan of these sharks has been estimated to be around 50 years. Declan, Tobin. " 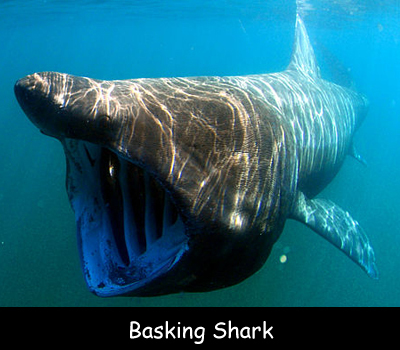 Facts for Kids about Basking Shark ." Easy Science for Kids, Apr 2019. Web. 21 Apr 2019. < https://easyscienceforkids.com/basking-shark/ >.